It’s a chilly, wintery, blustery sort of day. Even the trees shudder, their leaves falling down in chatterings. Thankfully, Zambia makes quick work of dissipating the cold, with this Spiced Tilapia Stew. 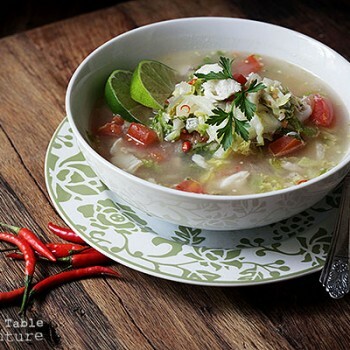 Each bite pops with fresh lime juice, tomatoes, and Napa cabbage. A dusting of cumin, mustard seeds, fresh ginger and garlic give the broth depth. But it’s the Thai Bird chilies that’ll clear your sinuses. Even just one in the pot promises a mellow tingle in every spoonful. This is another kind of DIY soup, because of the garnishes. 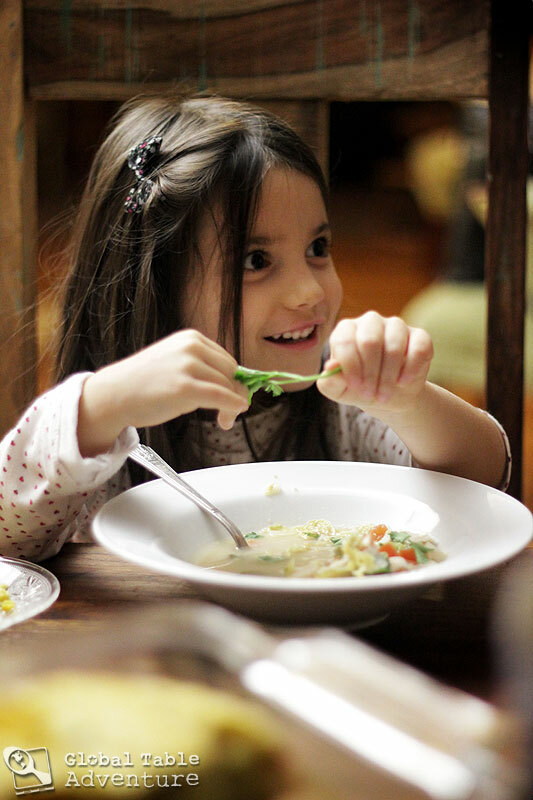 Children will especially enjoy squeezing lime juice on their soup and sprinkling their bowl with parsley. Adults will enjoy seeing how many Thai Bird chili peppers they can handle. My husband added an entire sliced chili to his bowl; though he was sniffling and coughing from the heat, he then proceeded to add more. 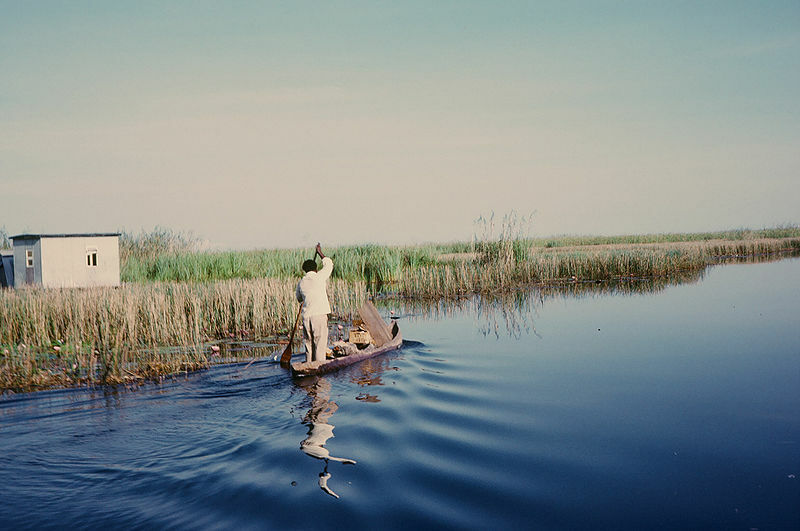 A note on the Tilapia: traditional Zambian stews often use dried tilapia. We’ve used fresh because it’s more readily available here in Tulsa. Either one will add great flavor, though dried fish will add a chewier texture. 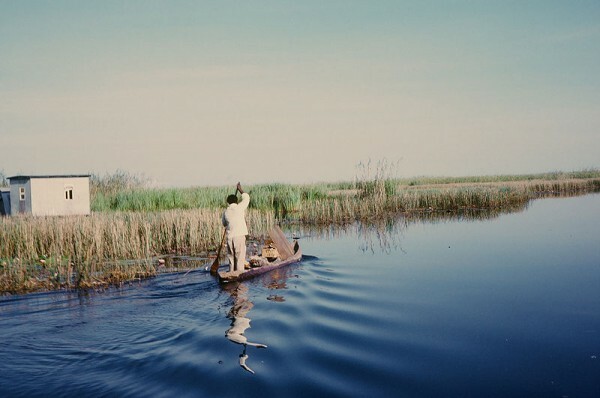 A resident fisherman enters Lukanga Swamp about 60 km west of Kabwe, Zambia. Photo DBrianWilson. 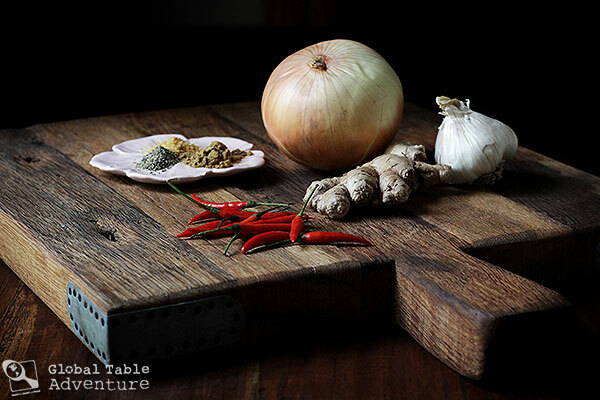 Adapted from Marcus Samuelsson’s “Discovery Of A Continent – Foods, Flavors, And Inspirations From Africa.” In Marcus’ version, he adds a cup of rice and a few other spices. Consider adding some rice for a heartier meal. Hello Zambia! Are you ready to get cooking? 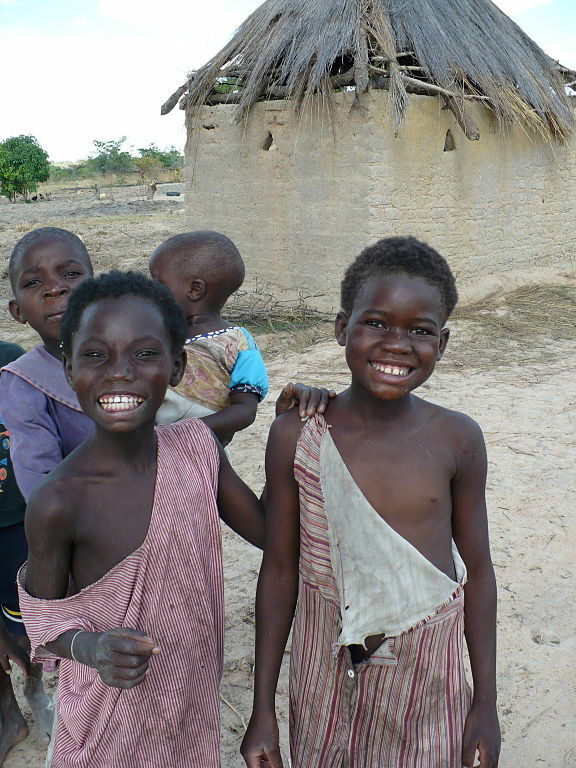 Zambian children in the countryside. Photo by Florence Devouard. This recipe can be as simple as some fish, water, and tomatoes in a pot, or you can go all out with the spices as Samuelsson teaches. In a large pot, fry the onion in peanut oil. When softened, add on the garlic, ginger, chilies, cumin, mustard seeds, and pepper. Cook a few more minutes, until fragrant. 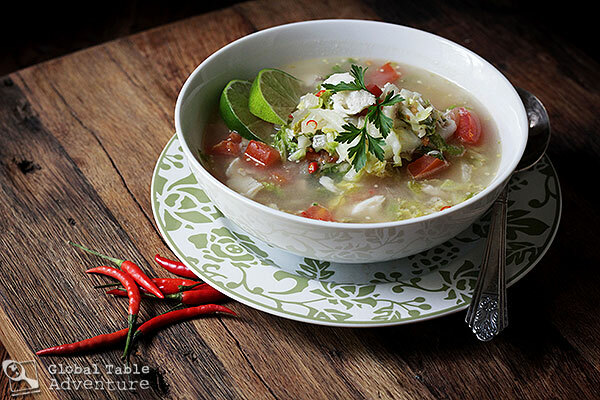 Then, add the tilapia, chopped tomatoes, napa cabbage, lime juice, water, and salt. A note on the salt: you’ll want to use a lot to balance out the tart lime juice (think the way the salt on a glass of margarita works), so don’t be shy about this! Simmer 15 minutes, or until the fish flakes apart easily (use your spoon to break apart the fillets into desired portions. Taste and adjust seasoning, adding more salt as needed. Serve with a sprinkling of herbs, lime wedges, and chili peppers, as desired. How many chili peppers can you handle? 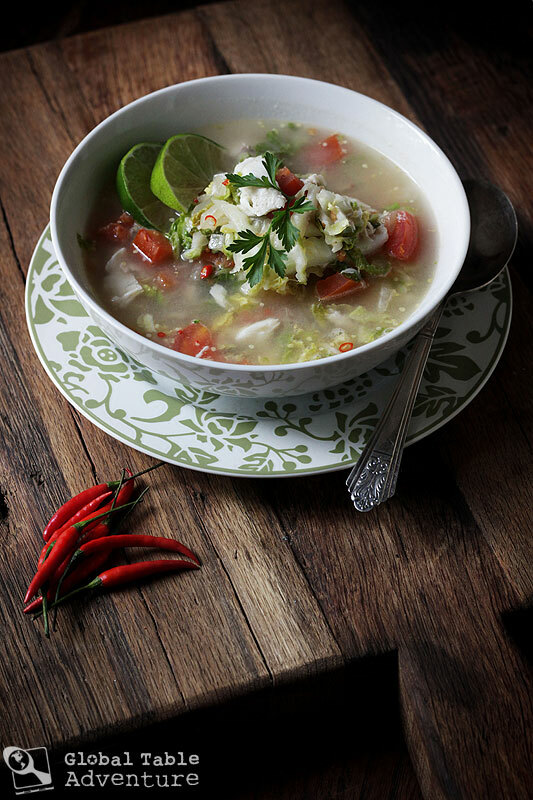 I’m a half chili pepper girl, when it comes to this soup. A note on the Tilapia: traditional Zambian stews often use dried tilapia. We've used fresh because it's more readily available here in Tulsa. Either one will add great flavor, though dried fish will add a chewier texture. In a large pot, fry the onion in peanut oil. When softened, add on the garlic, ginger, chilies, cumin, mustard seeds, and pepper. Cook a few more minutes, until fragrant. 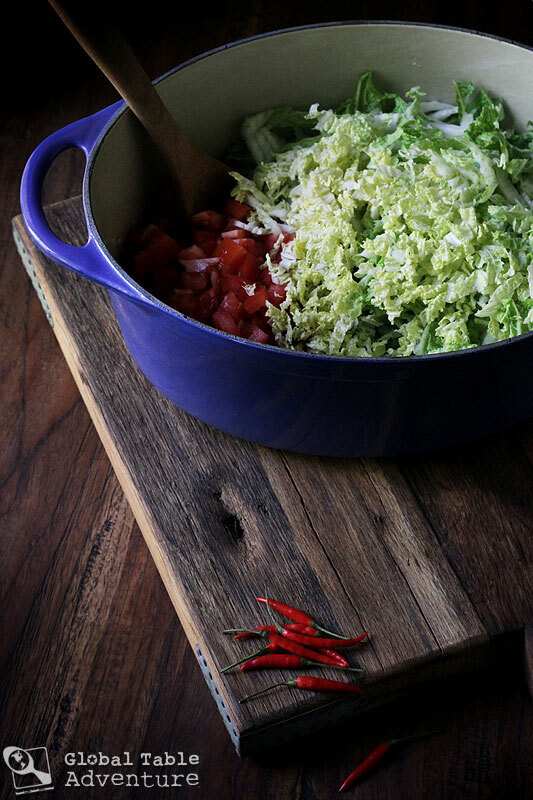 Add the tilapia, chopped tomatoes, napa cabbage, lime juice, water, and salt. Simmer 15 minutes, or until the fish flakes apart easily. The spice mix has me heating up already. I’m planning a vegetarian version, but will put fish in some. I will be starting at Croatia in 2 weeks to match seasons and continue the journey. I have a long way to go. Thank you very much for this delicious adventure. This looks like a good recipe. I live here in Lusaka and have the hardest time finding limes and cumin here. I don’t know any Zambians who cook with either of those ingredients. If you have a source for limes, please let me know. This recipe still looks like it’s worth trying. Thanks for sharing it. Another amazing African dish to try, not sure I can get Napa cabbage but it looks similar to bok choi so will try that and see if it works, thanks I love this african food safari thanks for the great ideas, plus I can get all of the ingredients fresh locally, I will let you know how it tastes!